SAC Communications, Inc. provides back-up power solutions to keep operations running smoothly despite commercial power-grid outages, brownouts, or surges. Drawing on vast experience in both AC and DC power, SAC specializes in complete EF&I (engineer, furnish & install) capabilities, as well as the best service and maintenance support in the business. Since I founded SAC in 1974, the demand for electrical power has soared, along with what's at stake for our clients and country. That's why every member of our tech team is not only factory trained, but continues to receive training in new skills and technologies. 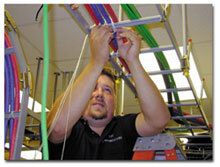 In addition to technical expertise, our team brings more than 40 years of real-world experience to each project. This enables us to move faster and deliver reliable excellence as we design, install and maintain the best solutions to protect operations, communications, and mission-critical data. SAC staff members are among the best-trained engineers and service technicians in the business. Their expertise is a critical factor in our ability to design excellent power back-up solutions and keep them operating at top performance levels year after year. Factory Training: Each member of our technical team receives full factory training on system components, including flooded and sealed VRLA batteries, rectifiers and DC power boards, converters, inverters, UPS systems, cabling, Bus systems and generators. On average, technicians have 15 hours of training on core components. Ongoing Training: Our skills never go stale! SAC continues to invest in both factory and industry training programs to keep our team abreast of new technologies, trends and processes. This ensures that no matter how "state of the art" your system or our project management methods become, our people can continue to make the most of them to give you solid solutions, service, and complete satisfaction. 40+ years of experience: In addition to being well trained, our staff is also well seasoned. They draw on more than 40 years of collective experience in protecting clients' power supplies from rolling blackouts, natural disasters, power surges, construction disruptions and emergencies. These years of real-world experience result in technical proficiency and the ability to take initiative in everything from cutting installation time to spotting potential problems before they cause trouble. By combining state-of-the-art technologies with decades of experience in meeting the back-up power needs of diverse clients worldwide, SAC has developed exclusive extra layers of protection no other source can provide. Every second of downtime costs you revenues, security, and  potentially  customers. That's why in sizing your solution, SAC does far more than simply take the number of amps your equipment is pulling and divide that into the total battery ampere hour capacity to come up with a "run time." This practice, though prevalent in the industry, fails to take into account that as the battery depletes its energy, its voltage collapses. There is also a loss of voltage over the cables connecting the batteries because currents increase as voltage falls. Instead, SAC uses its own proprietary voltage-assurance methodology to deliver a back-up system that reliably meets your real-world need for reserve power. As part of SAC's proven preventive maintenance approach, thermal infra-red imaging is used to record system graphic status with images that reveal temperature hot spots and potential problems. 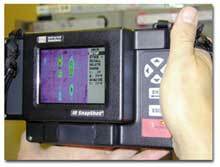 The SACGuard remote maintenance system provides 24/7 monitoring to spot problems fast. The system automatically sends emergency alerts so corrective action can be taken immediately, before system damage can occur and compromise the integrity of the back-up power supply.